During today’s session, the U.S. will release the ISM Manufacturing PMI report. Moreover, a key focus for traders regarding USD/JPY will be the trade talks between the U.S. and Canada where it is seems that a trilateral Nafta agreement has been agreed between them and Mexico. On the other hand, there is no news or major reports coming out of Japan during Monday’s session that may impact the next move of the pair. The pair has started October strongly. 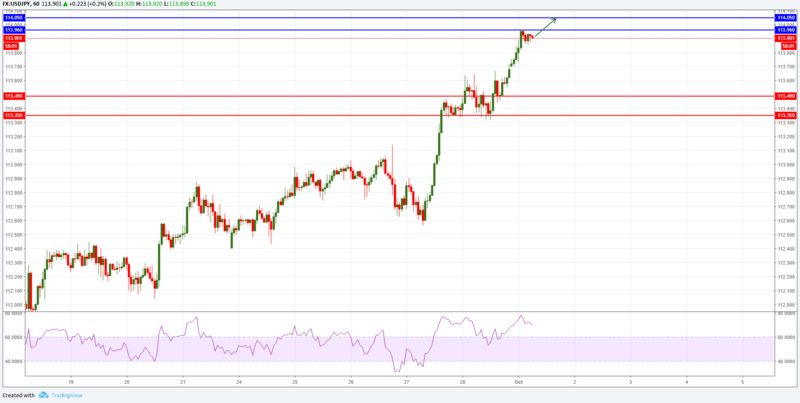 During today's session, Dollar may continue to rally towards the 113.96 level where it may break it and continue further in the direction of the 114.05 area. Overbought conditions seem to have appeared but given the strong fundamental support, they should not limit the pair's upside potential. During today's session USD/JPY seems to be a strong buy.